Mrs. Viola Irene Davis Desmond was born on July 6, 1914 in Halifax, Nova Scotia, to James and Gwendolyn Davis. One of 15 siblings, Viola was a successful entrepreneur who operated her own beauty parlour and college in Halifax. On November 8, 1946, while travelling to Sydney on a business trip, Viola stopped in New Glasgow when her car broke down. While waiting for her car to be repaired, she decided to watch a movie at the Roseland Theatre. Viola was unaware that, like many other institutions at that time, the theatre had a policy of discrimination. African Nova Scotians weren’t allowed to sit on the theatre’s main level. They had to sit in the balcony where the seating cost ten cents less than the main level. Viola tried to buy a ticket for the lower level, but was turned down. When Viola sat on the main level and refused to leave, the manager had police remove her from the theatre. After spending a night in jail, she was tried and convicted of defrauding the Province of the one penny in tax difference between a floor seat and balcony seat. She was given the option to pay a fine of $26, or go to jail for 30 days. Due to her business commitments, she chose to pay the fine. Her courageous stand against institutional racism was an important act in Nova Scotia’s civil rights movement, but it took a toll on her personal life. In the early 1950s, she closed her business and moved to Montreal, Quebec, where she enrolled in Business College. She eventually settled in New York where she passed away at age 50. 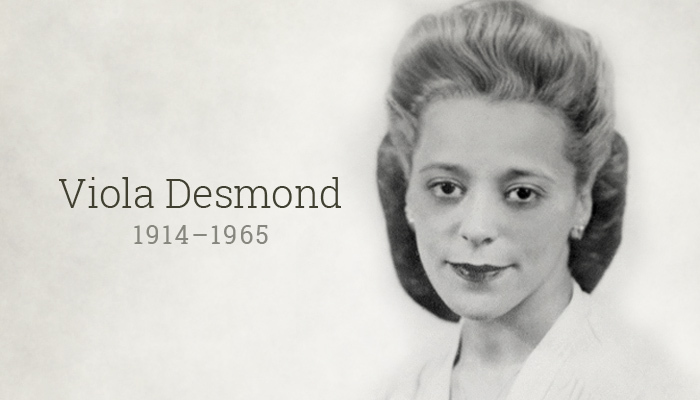 On April 15, 2010, the province of Nova Scotia granted an official apology and free pardon to the late Mrs. Viola Desmond, recognizing that the theatre and the courts treated her unfairly in 1946 because of the colour of her skin. On the advice of the Executive Council, the Lieutenant Governor exercised the Royal Prerogative of Mercy to grant a free pardon. A free pardon is based on innocence and recognizes that a conviction was in error. A free pardon is an extraordinary remedy and is considered only in the rarest of circumstances. It is meant to right a wrong. In this case, the free pardon is meant to right the wrong done to Viola Desmond. The Nova Scotia Archives is pleased to present, in digitized form, copies of the surviving legal documents from the Magistrate’s Court and the Supreme Court; representative provincial newspaper coverage from the time; and a short background article written by Henry Bishop. In honour of Viola Desmond, the Nova Scotia Museum has prepared an Infosheet that explains the background and significance of her actions in 1946 and 1947. Infosheets are part of the Nova Scotia Museum ePublications program and are intended to advance understanding of important subjects and encourage research by others. Virtual map that presents information about significant places and people who have contributed to the history of Gottingen Street and Halifax's North End. Nine years before Rosa Parks famously refused to give up her seat on a bus in Montgomery, Alabama, an African Nova Scotian entrepreneur made a similar stand in a New Glasgow movie theatre. This documentary highlights the life of Viola Desmond and places her action and its consequences in the broader context of the struggle for civil rights in Nova Scotia. This documentary pays tribute to a group of Canadians who took racism to court. They are Canada's unsung heroes in the fight for Black civil rights. Focusing on the 1930s to the 1950s, this film documents the struggle of 6 people who refused to accept inequality. Featured here, among others, are Viola Desmond, a woman who insisted on keeping her seat at a Halifax movie theatre in 1946 rather than moving to the section normally reserved for the city's Black population, and Fred Christie, who took his case to the Supreme Court after being denied service at a Montreal tavern in 1936. These brave pioneers helped secure justice for all Canadians. Their stories deserve to be told. In honour of Viola Desmond and the very first Heritage Day, Music Nova Scotia invited Nova Scotian singer/songwriters to submit their work for a chance to win $10,000. On Friday, February 13, the top three finalists perfomed at Casino Nova Scotia's Harbourfront Lounge before the winning submission was announced. To see the highlights of the finalist showcase, watch the "Viola Desmond Song Contest" video on Youtube. Below is a list of resources including books and CDs that are available through public libraries across Nova Scotia. Viola Desmond won't be budged / Jody Nyasha Warner; pictures by Richard Rudnicki. Groundwood Books, c2010. (children’s picture book). Leading the way: Black women in Canada / Rosemary Sadlier. Umbrella Press, c1994. The African Canadian legal odyssey: historical essays / edited by Barrington Walker. University of Toronto Press, c2012. Written by Viola Desmond’s sister, she explores the world she shared with Viola and ten other brothers and sisters. The Nova Scotia nine: remarkable women, then and now / portraits by Jo Napier ; stories by Joanne Wise. Published for the Advisory Council on the Status of Women by Communications Nova Scotia, 2014. Living in hope: Viola Desmond's Story. 1 compact disc (60 min.). CBC Audio, p2007. A dramatized account of a pivotal moment in Canadian race relations: on November 8, 1946 Viola Desmond refuses to move to the upstairs balcony in the Roseland Theatre, and is forcibly removed from the theatre and thrown in jail. The resulting legal battle was taken all the way to the Nova Scotia Supreme Court.